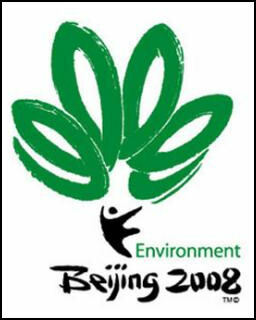 Beijing promised to host a green Olympics. Showers in the Olympics Village were heated by geothermal energy. The triathlon course was designed to protect the habitat of the rare giant salamander. More than 28 million trees were planted’some of them acting as buffers against Gobi desert sandstorms. Beijing said it spent $16.4 billion on environmental projects for the 2008 Olympics, including wastewater treatment plants, solar-powered street lamps, and water-saving nonflush toilets, with much of the money earmarked for moving heavy polluters out of the city. Beijing recycled a third of all waste materials, tripled the natural gas supply and generated electricity with Beijing’s first wind power station. The number of trash cans in Beijing was increased by around 10,000 to 25,000. One of the biggest problems that Olympic organizers had to deal with is Beijing’s air pollution, which increases in the summer when humidity and a lack of wind traps particles and pollutants in the air. International Olympic Committee President Rogge said that athletic performances might be “slightly reduced” because of the pollution and some events might have to be postponed or rescheduled if pollution levels were particularly high on a certain day. Coaches and athletes were quite upset by this statement because changing the time of an event at the last minute can cause trouble for an athlete orienting his training towards a particular day and time. Later Rogge said that air pollution situation in Beijing was “perfectly manageable." 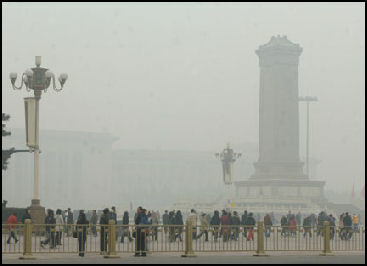 In some surveys, Beijing is ranked as the second most polluted city in the world. It's air quality is 16 times worse than New York City, and the amount of suspended particles is ten times higher than Los Angeles. Air pollution is measured on a scale of 0 to 500 with 200 being bad and 300 being harmful to health. Each year there are numerous days above 300 and occasionally there is a reading over 500, which is like having the mercury in a thermometer break through the top of a tube. According to one study breathing the air in Beijing is the equivalent to smoking three packs of unfiltered cigarettes a day. The air is so bad people sometimes go weeks without seeing the sun and sometimes even have trouble making out buildings a few blocks away. Newspapers run reports on the best times to go outside: usually before morning rush hour, in the middle of the day and before the evening rush hour and before the time when people cook their meals with coal stoves. 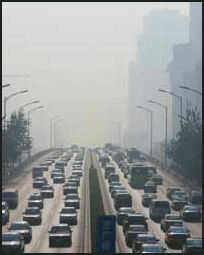 In March 2008, International Olympic Committee IOC issued a statement saying that the smog in Beijing could pose a health risk to endurance athletes such as those who participate in the marathon, triathlon, distance walking and swimming, mountain biking, and distance cycling events, Based on data collected in August 2007, the IOC said “there may be some risk” and the IOC will put in place “procedures, which will allow a “B-Plan” to be activated for such events if necessary.” Olympic events have been rescheduled before, notably ski events postponed because of bad weather. Beijing poses three risks for endurance athletes. The high heat and humidity can zap their energy; particulates, sulfur dioxide and carbon monoxide can trigger exercise-induced asthma; and certain pollutants can cause allergic reactions that cause air passage to become irritated or constricted. Particularly worrisome is ozone which can inflame a person’s windpipe and make it more difficult to breath. Treating allergies and asthma at the Olympics can be a problem because some medicines are banned substances. There are plans to conduct 4,500 drug tests, up from 3,500 in Athens. smog at Tianamen Square Olympic multi-gold-medalist and marathon world record holder Haile Gebrselassie of Ethiopia said he would not compete in the marathon at the Beijing Olympics because of the pollution. He suffers from exercise-induced asthma. He said he will compete in the 10,000 meters run. The British women’s marathon world-record-holder Paula Ratcliffe, who also has asthma, did not run. Gebrselassie told Spanish new sources, “It’s going to be the hardest marathon in history....I’d love to go for it, but health is my first priority.” Stefano Baldini, the Olympic gold medalist in Athens in 2004, said, “Pollution is a problem only for the guys with breathing problems. For me it is not a problem. The real problem is heat and humidity." Some countries have decided to house their athletes away from Beijing until right before the competitions so they are not adversely affected by air pollution. Similar strategies were also used in Greece for the Athens Olympics. Australian athletes said they would come to Beijing as late possible to avoid the air pollution. Teams from 20 countries---including Britain, Germany, Sweden and Brazil---prepared in Japan. Fifteen others---including the Netherlands, and Switzerland---based themselves in South Korea. American athletes set up shop in Dalian, a relatively clean, Chinese coastal city. 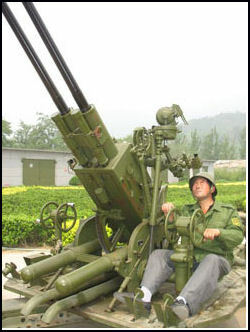 Several countries requested that Beijing provide training facilities close to but not in Beijing. So many athletes may put off coming to Beijing until the last minute many might miss the Opening Ceremonies. U.S, athletes had access to surgical masks designed for non-competition use. Scientist with the U.S. Olympic Committee experimented with different types of face masks to find one that effectively filter outs pollution particles but allows enough air to come through. Four American track cyclists arrived at Beijing International Airport wearing their U.S.-Olympic-Committee-issued air-filtration masks. There was a big uproar, Their pictures were shown all over the world. The Chinese felt insulted. The cyclist quickly apologized and the episode was quickly forgotten. 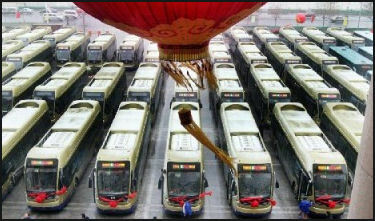 Fleet of electric buses Chinese scientists were ordered to produce of quota of “blue sky days” in Beijing. Much of the $12.2 billion earmarked for cleaning up the city was focused on cleaning up the air. More than 200 of the foulest smokestack industries and power plants were closed or moved. An entire steelworks---Capital Iron and Steel---was moved out of Beijing, 100 miles to the east. It had been in Beijing for 50 years and used to emit nasty “red smoke all night” and once produced a toxic gas cloud that caused several people to choke to death. Power plants were modified to reduce emissions; 16,000 coal-burning factories were renovated; 1,000 small coal mines were closed. Factories in the greater Beijing area and coal mines in nearby Shanxi Province were supposed to close down for weeks or months before the Olympics. Gas stations closed, industrial spraying and painting was banned. All construction was stopped to reduce dust levels. Officials with the Beijing Olympics Organizing committee sais their efforts payed off before the Olympics, saying that number of blue sky days has increased from 100 in 1998 to 241 in 2006. Beijing set up a state-of-the-art control room that measured pollution at 27 monitoring stations around the city. But it was been less than forthcoming with data from these stations and of details of its pollution-fighting plans and success at reaching its goals. The stonewalling and lack of information about specific pollutants and specific areas made people suspicious. Promises to close factories outside Beijing and nearby cities were broken, apparently because some factories refusing to follow government orders to close down. The whole idea of tallying “blue sky days” as a way of measuring pollution was regarded as a joke by many scientists. In April 2008, the Chinese government announced that Beijing would close factories and force 19 heavy polluters to reduce emissions by 30 percent two months before and during the Olympics and said if the weather conditions were particularly bad even more extreme measures would be taken. Other measures were taken in Tianjin, Hebei, Inner Mongolia, Shanxi and Shandong. Among the 19 polluters were several plants run by Shougang Steel---the Beijing’s worst polluter---Yanshan Petrochemical group, Jinganeneg Thermal Power and three other coal-burning plants and Number 27 locomotive Factory. The Eastern Chemical Plant of Beijing and several cement factories were shut down completely as were industrial coal-boilers and gas station that don’t meet emission standards that are among the toughest in the world. Fifty factories, including two cement makers, in Tianjin, 115 kilometers east of Beijing, and 300 factories in Tangshan, 150 kilometers east of Beijing, were ordered to close from late July to mid September. 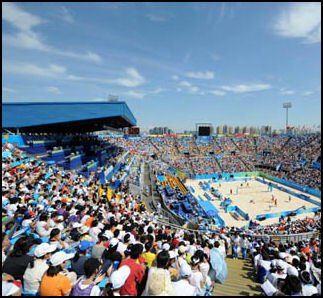 Tianjin, which hosted some Olympic soccer games, halted the construction of 26 buildings during the Games. A contingency plan was in place to close even more factories and coal-fired coal plants and impose driving restrictions in Tianjin and other cities around Beijing if pollution worsened during the Olympics. even license plates Emission standards were tightened on vehicles in the wake of the 2008 Olympics. More than 50,000 smog-producing taxis were taken off the streets and replaced with more efficient models. More than 4,000 buses were put in operation that ran on natural gas and produced virtually no emissions. In August 2007, Chinese authorities reduced the number of cars in Beijing by 1 million over a four day period using an odd-even licence plate system that was a test for a similar system to be used during the Olympics. Even though skies were still hazy and brown as usual and pollution levels were slightly higher than before the test, the authorities deemed the test a success, saying that pollution readings were in the 90s. Readings of 100 to 200 are regarded as slightly polluted. The Chinese media was told to play up the positive aspects of the test. Cars with even numbered license plates were barred from driving two days. Cars with odd numbered license plates were barred from driving on two other days. Taxis, buses, police cars ambulances were exempted. Bus and subway service was increased. Traffic ran smoothly and there were few complains about lines for buses or subways. Driving restrictions began about 2½ weeks before the Opening Ceremonies and continued for about a month after the Olympics ended. Half of Beijing’s vehicles were kept of the roads using the odd, even license plate system. Taxis, buses and emergency vehicles were exempted from the rules. 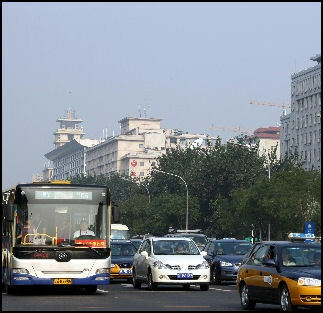 Beginning in early July, about 300,000 vehicles that failed to meet strict emission standards were banned from downtown Beijing. 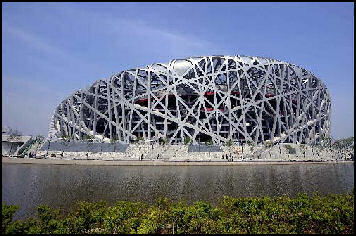 blue skies over the Bird Nest The first few days of the Olympics were smoggy but overall Beijing experienced its cleanest air in more than a decade during the Games. There were several genuinely blue sky days as anti-pollution measures and heavy rains cleared the air. In the month of August there were 14 “level one” days---the highest possible rating. Major pollutants were down 50 percent during the 16 days of the Olympics and down 45 percent for the month of August. Among the biggest improvements was lowering carbon monoxide levels by getting rid of the main cabon monoxide source, cars idling in heavy traffic. The pollution curbs were kept in place for about a month after the Olympics were over. At that time construction resumed, factories resumed production and drivers could drive their cars whenever they wanted. Over all the air pollution index dropped from 142 in May to 90 in June and 77 in July reaching 56 in August and 57 in September. After the anti-pollution restrictions were lifted in September the pollution returned, with a 73. Things improved somewhat when a policy was enacted that banned cars once a week based on license plate number. The Chinese were obsessed with the weather before and during the Olympics. There was an entire newspaper devoted to the topic. Athletes were equally obsessed. American distance runners wore special vests placed in a freezer to cool their bodies before the start of the race. Four satellites were positioned to transmit weather data during the Games. Radar systems were upgraded so that storms and rainfall could be predicted for specific venues. The Beijing Weather-Engineering Office hired 32,000 people and set up 26 controls stations to create a “defensive web” around the Bird’s Nest stadium to prevent rain that might dare to fall on the Opening Ceremonies. Weather forecasters ran hourly forecasting meetings; used advance radar to monitor things like approaching typhoons, weather fronts and evening thunderstorms; and employed a super computer recently bought from IBM for “several million dollars” to help to predict the weather and pollution levels. rainmaking artillery The IBM supercomputer is 1,000 times more powerful than any other weather forecasting system used at previous Olympics. With this technology forecasters hope to make detailed forecasts for specific sites and sports and help athletes by giving them accurate predications of wind speeds and direction and temperatures at specific times of the day. The computer will provide every venue with three-hourly forecasts and half-hourly satellite pictures. The information will be distributed on text messages, TV screens, scoreboards and the Internet. Meteorologist from seven countries---China, Japan, the United States, France, Australia, Canada and Austria---will compete to see who can predict the weather most accurately. Weather forecast will be made every three hours for up to 36 hours in advance and the champion will be determined based on how well the forecasts match up with the real weather. The weather turned out to be very cooperative, extraordinarily so. Before the Olympics the weather went according to script. June was the wettest June in 15 years and the heavy rains that fell then helped cool temperatures and clean up the air when the full scale anti-pollution measures kicked in at the end of July. Smog accumulated though despite the measures but it was washed away thank to winds and rains associated with Typhoon Fung-Wong which made landfall south of Beijing. But soon after that air-clearing rains arrived. The timing of the rain was good. It didn’t affect the Opening Ceremonies and it spectacular fireworks or other major events. As a preventive measure 1,104 rockets were fired over an eight hour period from 21 places to disperse clouds and make sure no rain fell on the Opening Ceremonies. Rain was cited by Opening Ceremonies director Zhang Yimou as the biggest threat to success of the event. The rain mainly caused disruptions for minor sports. It delayed tennis matches and rowing events; made marshes out fields for team sport events; and created some unanticipated problems. The New Zealand field hockey team, for example, abandoned their white uniforms because when it rained they “get a bit see-through.” The rain was a boon for some events. It cooled the endurance races. After the heavy rains heat and pollution were not big problems and there were a number of “blue sky days” in which the skies were truly blue, the air was clean, and the humidity manageable---all rarities in Beijing.